I have played a few solo tests of The Two Fat Lardies Troops, Weapons & Tactics rules and last night rolled it out for our Monday Night game. These rules have been superseded by Chain of Command but after reading both I had a leaning towards TW&T especially because of the way Leaders/Big Men are treated. The other reason it appealed to me is many of its processes parallel the I ain't Been Shot Mum rule set which I like too! Everyone seemed to be happy with how the game played but it was a tad slow as we were all learning the rules as we went. I umpired and we had single German player defending against two attacking British players. I made a few blinder mistakes while umpiring/training, not adding a German squad's card to the action deck when it entered play was he biggest (this meant it spent a few 'rounds' taking punishment idly sipping on ersatz coffee), also I missed some end of turn units reserved actions, I didn't have a reinforcement section available for the attackers when that random event occured (crikey a 1 in 36 chance!) 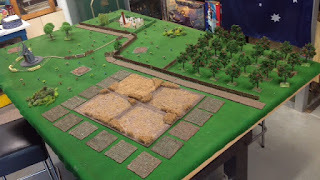 and lastly not going through the pinning fire process...if the other guys want another game set up I'll definitely organise one, as it is I'll continue to play it solitaire in the hope of mastering the rules. Late August 1944 the British 11th Armoured Division pushed toward Antwerp against stiffening German resistance from the 15th Army. 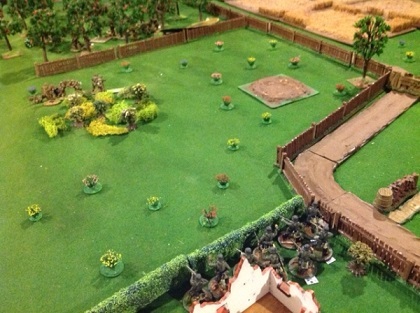 The 1st Battalion, Herefordshire Regiment from the Divisions infantry support Brigade was assigned the mission to clear their left flank. 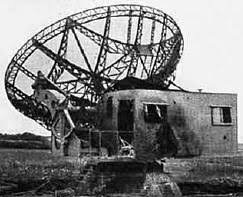 The British must occupy the Wuzburg radar station or break the German forces. 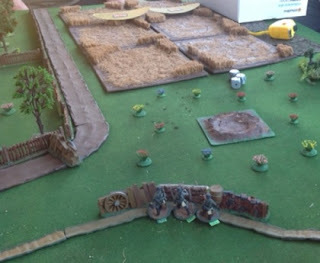 Some pictures, I took very few as running the game kept me busy! 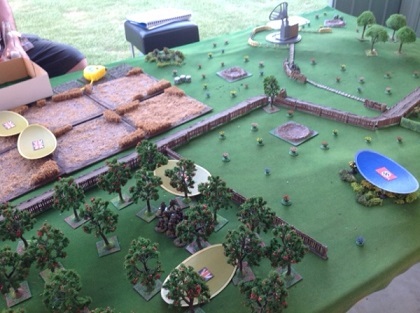 The battle field, the road runs east west with the west edge of the gaming area closest in the picture, the radar station defences are aligned against an attack from the north i.e. the coast...but the British will be entering from the west! The first Jerries are spotted an LMG team! 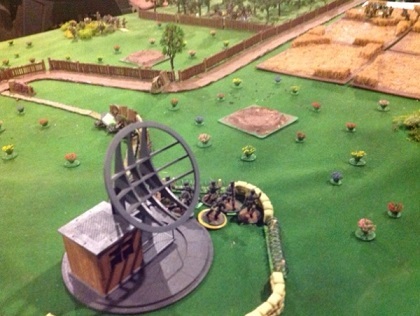 In the game the British held back and preferred to wear the Germans down with fire rather than rashly rush into an attack on the radar station, it slowed things down but with no time limits on their attack made sense, I added two German HMGs onto the field to liven things up a bit but time beat us and the game wasn't concluded, mind you it was just a rules run through so I wasn't fussed. Bit late, but thanks for the game Peter, the mechanics were the all important focus for the night and for Alan and I having not played before, it took some time coming to grips. I think the first burst of the German MG34 on the troops in the open slowed us down considerably and advancing on unknown positions, particularly when the MG42 appeared, meant a frontal assault across open ground would be borderline suicide. Like any game, working out what damage you can take, what damage you can dish out and whether real life tactics are rewarded takes a while. I had my Second Lieutenant mind set going, don't waste lives ! The table was excellent, the scenario great, next time when we are familiar I think we will play much better. I like the ruleset so far. thanks for the game.